The Curious Incident of the Dog in the Night-Time by Mark Haddon, is a beautifully written novel that is eye opening, thought provoking, and touching. The Curious Incident of the Dog in the Night-Time by Mark Haddon is about a fifteen year old boy named Christopher Boone. Christopher loves math, hates the color yellow, and lives his life by following various patterns and rules. One day, the neighbor's dog is killed and Christopher is wrongly blamed. Christopher takes it upon himself to find out who the real killer is. While on his investigation, Christopher finds out much more than he was ever expecting or looking for. This novel is absolutely stupendous. It is beautifully crafted with Mark Haddon's exquisite writing style. The character development is also phenomenal. You really fall in love with the characters throughout the book while suffering through their struggles alongside them. The voice throughout the novel is spot on. I really enjoyed how all the chapters were prime numbers, to add to the voice of Christopher. Additionally, I enjoyed all the different math problems and topics in the book, and thought they were really interesting. This is a very eye opening and touching novel. At points it really pulled at your heart strings. I learned so much by reading this novel and I am truly grateful I decided to read The Curious Incident of the Dog in the Night-Time by Mark Haddon. I rate this book 5 out of 5 stars. I highly recommend this book to readers ages 13 and up, so the reader may have a better understanding of some of the topics discussed and some of the language. Counting by 7s by Holly Goldberg Sloan and Out of My Mind by Sharon Draper are two books that are somewhat similar to The Curious Incident of the Dog in the Night-Time by Mark Haddon. These two books are directed towards a younger audience than The Curious Incident of the Dog in the Night-Time by Mark Haddon but they are also wonderful. All of these books feature similarities between their protagonists. While these books are very different at points, they are also somewhat similar. The Blood Guard is a spectacular mix of Hollywood Blockbuster action, and spell-binding suspense. This book is about a boy named Evelyn Ronan Truelove. Suddenly one day his mom, who is a museum curator, picks him up from school and tells him that his father has been kidnapped and that she is part of a secret society called The Blood Guard. The Blood Guard protects 36 people who are called pure. If anything happens to any of these pure, catastrophic events will start to occur. During all of this explaining, Ronan and his mom are being chased by the Bend Sinister. The Bend Sinister is the Blood Guards worst enemy. They will stop at nothing to kill any of the pures. Ronan's mom has to leave him at a train station to meet up with another guard member as she goes off to find and return Ronan's dad. Ronan will make new friends, create enemies, learn more about his mom and these secret societies, all while being chased down by the Bend Sinister. I would love to see this book made into a movie. The ending caught me quite by surprise. The character development and imagery were both superb. I also thought that the plot development was at just the right pace to keep your attention. This book was a very quick read. 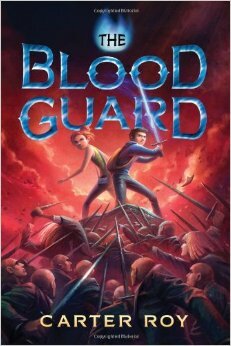 The Blood Guard is just right for various ages, and fits under several different genre's. I rate this book 4 out of 5 stars. I received this book via Net Galley courtesy of Two Lions in exchange for an honest review.